Building a fairer Europe and strengthening its social dimension is a key priority for this Commission. Today, it delivers on its promise to adopt its proposal for the European Pillar of Social Rights. The Pillar sets out 20 key principles and rights to support fair and well-functioning labour markets and welfare systems. The Pillar is designed as a compass for a renewed process of upward convergence towards better working and living conditions in Europe. It is primarily conceived for the euro area but applicable to all EU Member States wishing to be part of it. The Pillar was prepared by the Commission, under the leadership of Vice-President Dombrovskis and Commissioner Thyssen, in close consultation with stakeholders at all levels. It reaffirms rights that are already present in the EU and international legal acquis and complements them to take account of new realities. The principles and rights enshrined in the Pillar are structured around three categories: equal opportunities and access to the labour market, fair working conditions and social protection and inclusion. They place the focus on how to tackle new developments in the world of work and society at large so as to deliver on the promise of the Treaties of a highly competitive social market economy, aiming at full employment and social progress. Delivering on the principles and rights defined in the European Pillar of Social Rights is a joint responsibility of Member States, EU institutions social partners and other stakeholders. The European institutions will help to set the framework and lead the way forward for the implementation of the Pillar, in full respect of Member States' competences and social dialogue traditions. A number of principles and rights included in the Pillar will require further legislative initiatives to become effective. Where needed, existing EU law will be updated, complemented and better enforced. 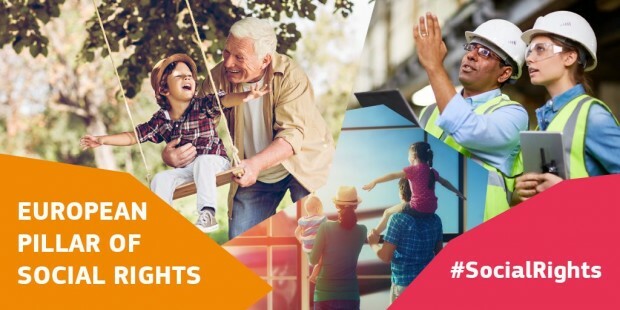 Already today, the European Commission flanks the European Pillar of Social Rights with a number of further concrete legislative and non-legislative initiatives such as on the work-life balance of parents and carers, on the information of workers, and on access to social protection and on working time. These initiatives illustrate both the nature of the issues covered by the Pillar as well as the way in which its principles and rights can be implemented.